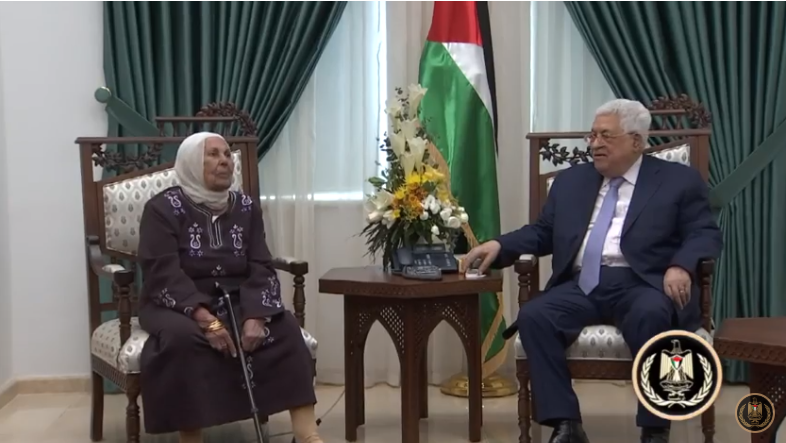 Mahmoud Abbas and Karim Yunes' mother in Ramallah (Wafa and Mahmoud Abbas' YouTube channel, November 18, 2018). 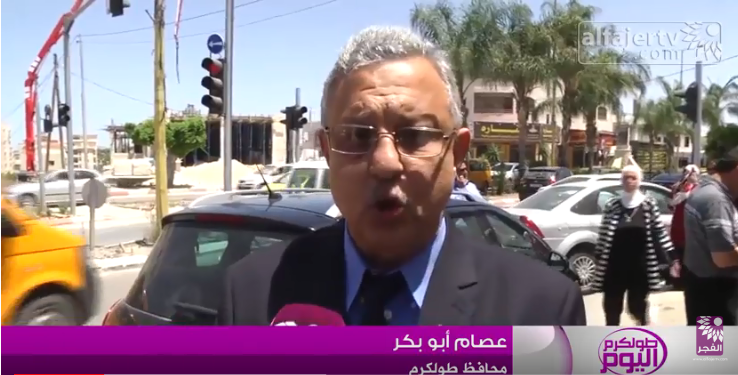 Issam Abu Bakr, governor of the Tulkarm district, at the unveiling of the Maher Yunes square and street in Tulkarm (YouTube channel of al-Fajr TV in Tulkarm, May 11, 2017). 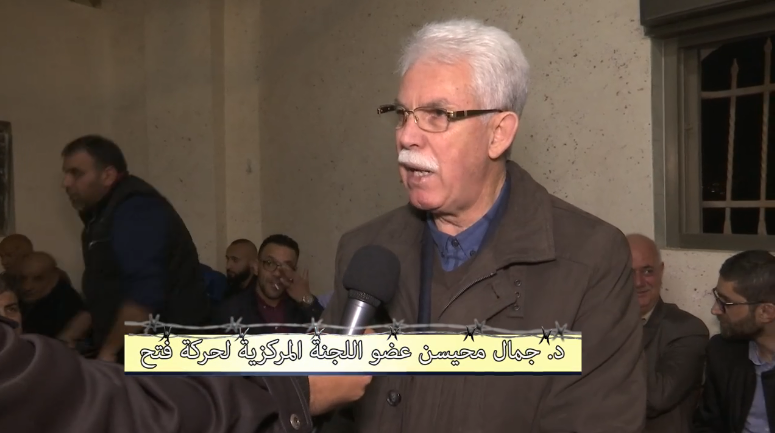 Issam Abu Bakr, governor of the Tulkarm district, interviewed after the ceremony in the square, praises Palestinian terrorist Maher Yunes (YouTube channel of al-Fajr TV in Tulkarm, May 11, 2017). 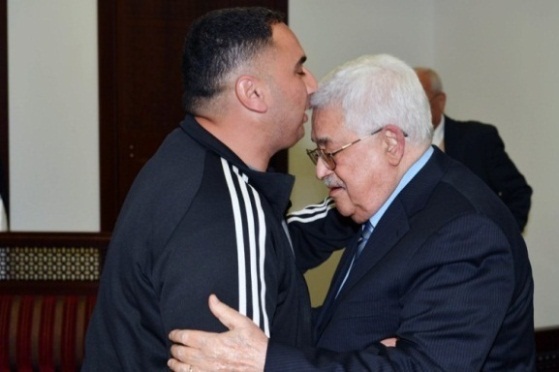 The terrorist, Rajaa'i Hadad, embraced by Mahmoud Abbas during a reception held for him at Mahmoud Abbas' office in Ramallah (Wafa, March 14, 2018). 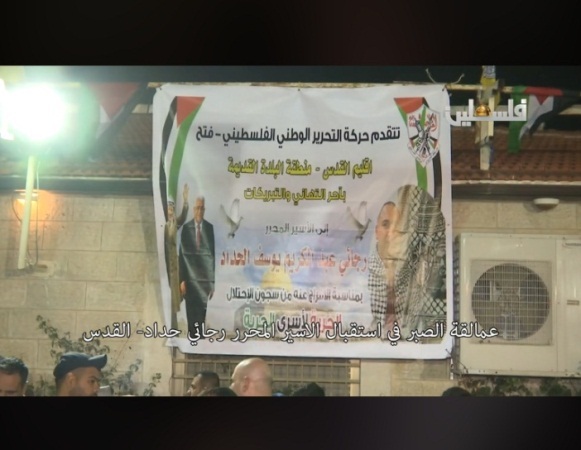 The reception held in al-Ram for Palestinian terrorist Rajaa'i Hadad upon his release from an Israeli jail (Facebook page of Palestinian TV, March 17, 2018). Mahmoud Abbas recently met in his office in Ramallah with the mother and brother of Karim Yunes, who with his cousin Maher Yunes abducted and brutally murdered an Israeli soldier (both are currently serving life terms in Israeli jails). The meeting was preceded by other Fatah and PA events honoring terrorists who kill Israelis, for example, a ceremony honoring them sponsored by Mahmoud Abbas, held in Ramallah; appointing Karim Yunes to Fatah’s Central Committee; naming a town square and street in Tulkarm for Maher Yunes; and naming a main street in Jenin for Karim Yunes. Those expressions of respect and honor, sponsored by Mahmoud Abbas and the PA, are well-known phenomena (for example, Mahmoud Abbas’ meeting in March 2018 with the terrorist who murdered an Israeli civilian in the Old City of east Jerusalem and was released from an Israeli jail). 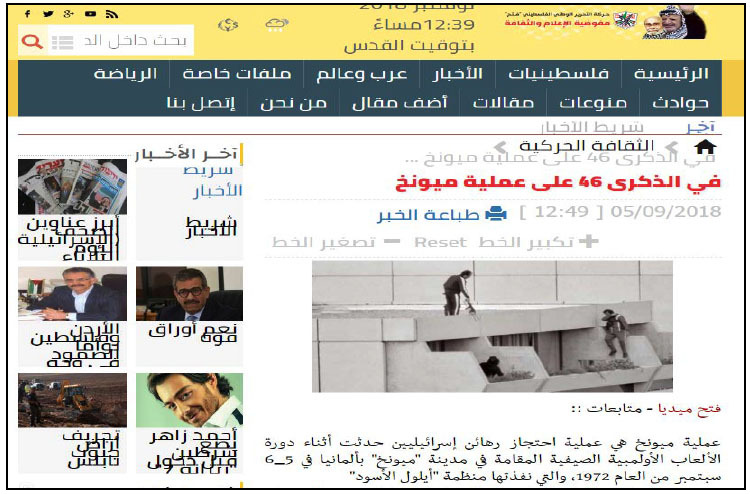 The PA and Fatah regard the terrorists imprisoned in Israel and those killed in terrorist attacks (shaheeds) as national heroes, and turns them into role models, even those who carried out mass murders (for example, the terrorists who carried out the Coastal Road Massacre in 1978 and the slaughter of the Israeli athletes at the Munich Olympics in 1972). Therefore, the PA and Fatah often express their support for terrorists imprisoned in Israel, foster the shaheed cult and provide generous financial support to prisoners and the families of shaheeds. The PA continues its financial and moral support, despite the pressure exerted on it by the Trump administration and the State of Israel. On November 18, 2018, Mahmoud Abbas met in his office in Ramallah with the mother and brother of Karim Yunes, an Israeli Arab who abducted and brutally murdered Israeli soldier Abraham Bromberg, for which he was sentenced to life imprisonment. The meeting to honor the terrorist’s family was held close to the date Abraham Bromberg was murdered (he was shot in the head on November 26, 1980, and died on December 1, 1980). At the meeting with the family of the murderer, Mahmoud Abbas stressed that the issue of the Palestinian prisoners was the top priority of the Palestinian leadership, which was investing all its efforts to obtain their release. Also present at the meeting were senior Fatah figures Hussein al-Sheikh, Muhammad al-Madani, Muhammad Ashtiya and Saeb Erekat (Wafa, November 18, 2018). 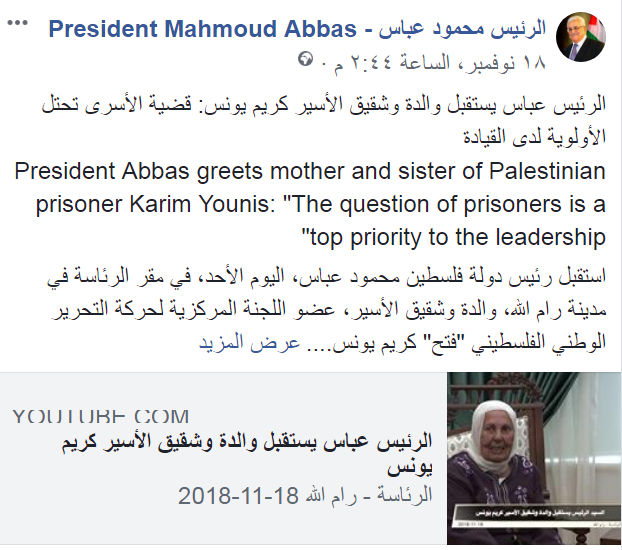 Mahmoud Abbas uses his official Facebook page to publicize his meeting with the family of Palestinian terrorist Karim Yunes, including a short video of the meeting in his office in Ramallah (Mahmoud Abbas’ Facebook page, November 18, 2018). In November 1980, Karim Yunes and his cousin Maher Yunes, both Israeli Arabs from the town of ‘Ara in central Israeli, abducted and brutally murdered IDF Sergeant Abraham Bromberg. The two acted on orders from a relative named Sami Yunes, from the village of ‘Ar’ara in central Israel. They took the soldier, who was hitchhiking from his base in the Golan Heights, to a house in Zichron Yaakov (central Israel). While driving in the area of Wadi Ara (central Israel) they shot him in the head, stole his weapon and threw him out of the car in an open field. He was found by an Electric Company employee and taken to a hospital, where he later died. Karim Yunes and Maher Yunes were detained in January 1983. A military court sentenced them to death but later their sentence was reduced to life imprisonment. In 2012 it was further reduced to 40 years imprisonment. Sami Yunes, who sent the two to carry out the murder, was sentenced to life imprisonment but was released in the Gilad Shalit prisoner exchange deal (and died in 2015). 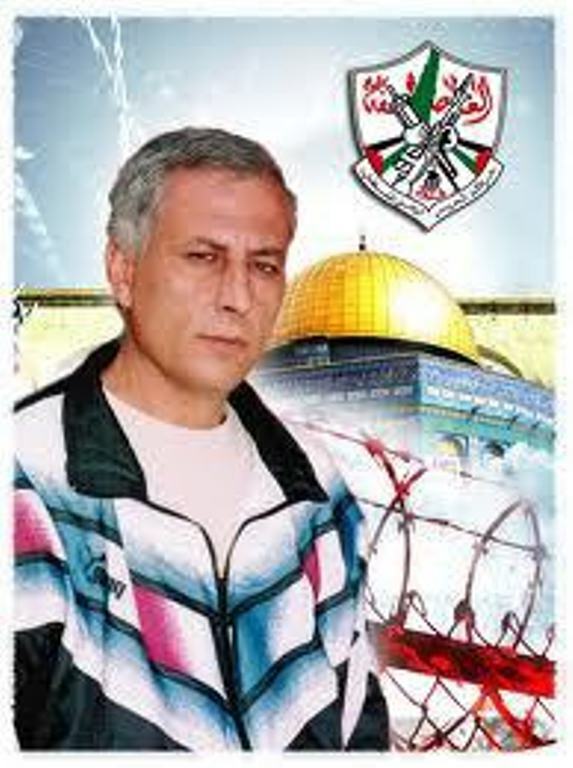 Karim Yunes became the longest-serving Palestinian prisoner in Israel (nicknamed “the dean of the Palestinian prisoners”) and has often been honored by the PA and Fatah. Right: Abraham Bromberg (NGO of the Technological and Logistics Directorate, November 20, 2018). 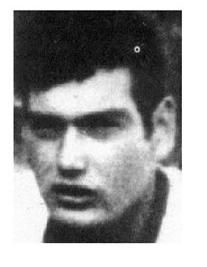 Left: Fatah picture of Karim Yunes, one of Abraham Bromberg’s murderers. 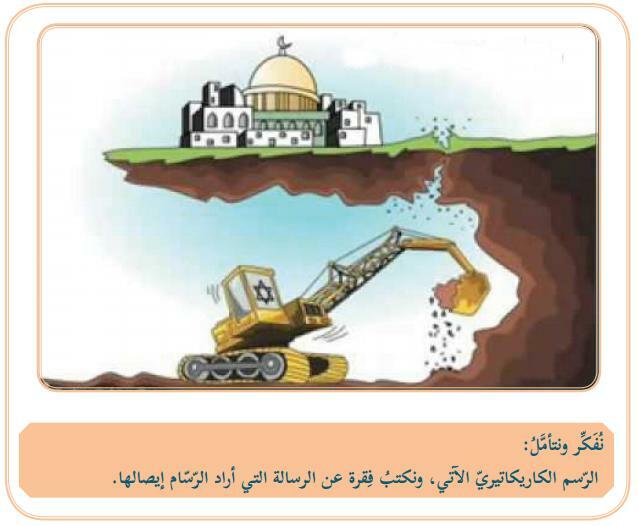 The Fatah logo is in the upper righthand corner (blog of Hashem Saqallah, January 5, 2017). Ceremony in Ramallah honoring Karim and Maher Yunes, sponsored by Mahmoud Abbas (January 2018). The recent meeting in Ramallah between Mahmoud Abbas and the family of Karim Yunes was another example of the events held by the PA and Fatah to glorify the images of Karim and Maher Yunes. On January 14, 2018, a ceremony honoring them was held in Ramallah. Sponsored by Mahmoud Abbas, it was held to mark the beginning of the 36th year of their imprisonment. Mahmoud al-‘Alul, deputy Fatah chairman, represented Mahmoud Abbas at the ceremony. Also present were Jamal Muheisen, Rawhi Fattouh, Haj Isma’il Jabr, Abbas Zaki and Dalal Salameh, all members of Fatah’s Central Committee; Issa Qaraqe, at the time chairman of the PA commission of detainees and ex-detainees affairs; Laila Ghannam, governor of the district of Ramallah and al-Bireh; and Qadoura Fares, director of the Palestinian prisoners’ club. During the ceremony 36 candles were lit, one for each year of imprisonment. Mahmoud al-‘Alul, who gave a speech in the name of Mahmoud Abbas, Laila Ghannam, Issa Qaraqe, Qadoura Fares and other speakers all noted that “Karim Yunes and Maher Yunes are symbols, examples of the Palestinian struggle and a source of pride for all Palestinians.” Laila Ghannam said that everyone had to support them and their relatives until their release (Wafa and the website of the PA Commission of Detainees and Ex-Detainees Affairs, January 14, 2018). In May 2017 Fatah’s Revolutionary Council appointed Karim Yunes to the Central Committee, the highest institution in the Fatah movement. Ali Dayak, minister of justice in the PA government, said the decision made by Fatah, headed by Mahmoud Abbas, to appoint Karim Yunes, nicknamed “dean of the Palestinian prisoners,” to the Central Committee came in response to the Israeli campaign to “to put a label of terrorism on the prisoners, the shaheeds and the Palestinian struggle” (al-Hayat al-Jadeeda, May 28, 2017, according to Palestinian Media Watch). Issa Qaraqe, chairman of the PA commission of detainees and ex-detainees affairs, praised the appointment, saying it was a declaration that the Palestinian prisoners “are not terrorists and are not criminals,” but rather “prisoners of freedom and warriors” (Palestinian TV, May 28, 2017, according to Palestinian Media Watch). 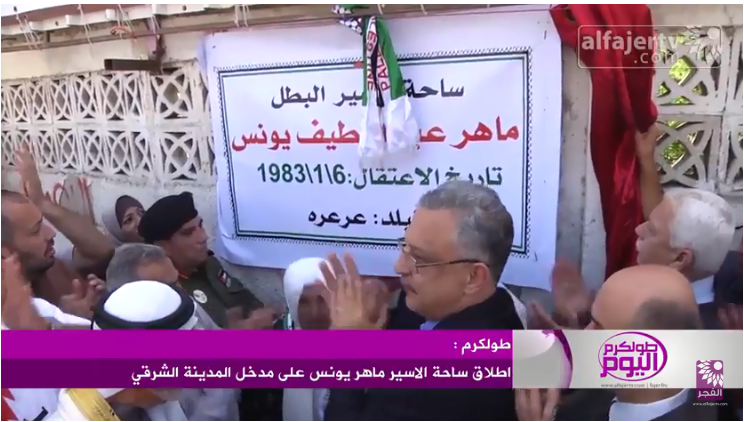 On May 11, 2017, Issam Abu Bakr, governor or the Tulkarm district, held a formal ceremony to open a square and street in Tulkarm named for prisoner Maher Yunes. The ceremony was attended by the mothers of Maher and Karim Yunes; relatives from the village of ‘Ara; Farid Abu ‘Aqal, the mayor of Tulkarm; and Fatah members from Tulkarm. During the ceremony district governor Issam Abu Bakr said the square was named in honor of Maher Yunes, who had been imprisoned in Israel for more than 35 years. 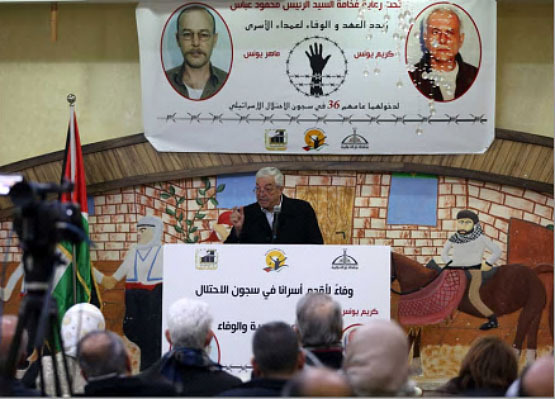 He thanked the Tulkarm municipality and all those in the district for their “national act” of supporting the prisoners. He said they always stood by their fighters and that there would be more such ceremonies in other districts (Ma’an and the YouTube channel of al-Fajr TV in Tulkarm, May 11, 2017). On May 2, 2017, the PA named a main street in Jenin for Karim Yunes, the so-called “dean of Palestinian prisoners.” The ceremony took place during a large Fatah rally held under the auspices of Ibrahim Ramadan, governor of the Jenin district, the Fatah movement and the Jenin municipality. During the ceremony Ibrahim Ramadan read a message from Mahmoud Abbas (al-Ayam, May 2, 2017, according to Palestinian Media Watch; al-Hayat al-Jadeeda, May 19, 2017). Right: Ibrahim Ramadan, governor of the Jenin district, sits next to the mother of terrorist Karim Yunes at the ceremony in Jenin. 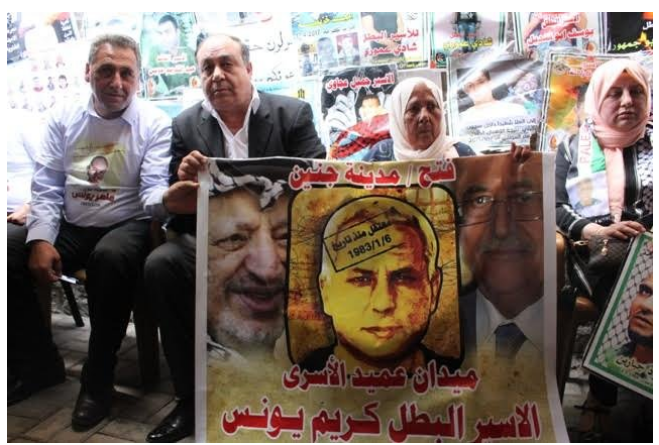 They hold the two corners of a poster with the pictures of Yasser Arafat, Karim Yunes and Mahmoud Abbas (bakara.net, May 18, 2017). 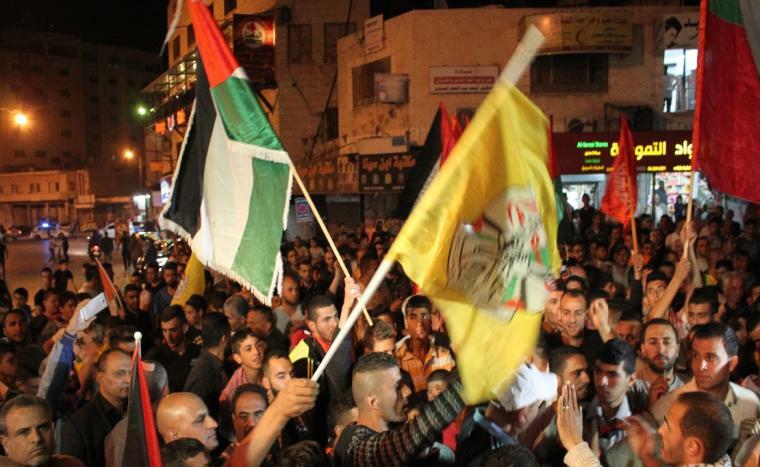 Left: A large Fatah rally in Jenin, during which a main street was named for Karim Yunes. On March 14, 2018 Mahmoud Abbas hosted a festive reception in his office in Ramallah for Rajaa’i Abd al-Karim Hadad. Hadad is a Fatah terrorist who served a twenty-year prison term in Israel for his participation in a shooting attack carried out in the Old City Jerusalem in 1997. During the reception, which was extensively covered by the Palestinian media, Mahmoud Abbas congratulated the terrorist on his release and stressed that the issue of the Palestinians imprisoned in Israeli jails is at the top of the Palestinian leadership’s priorities. Gavriel Hirschberg was killed in a shooting attack when he and a friend were en route to the Ateret Kohanim yeshiva. Gavriel Hirschberg was killed instantly and his friend was critically wounded. 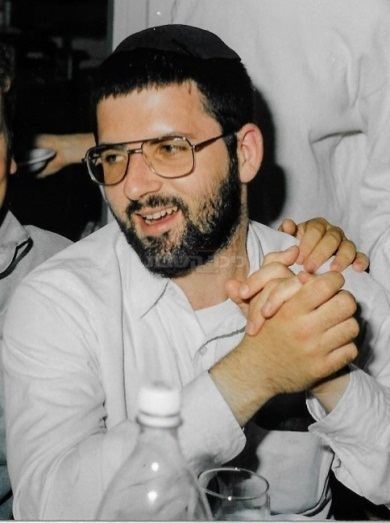 Right: Gavriel Hirschberg, killed in a shooting attack in the Old City of Jerusalem, November 20, 1997 (website for the Commemoration of the Victims of Palestinian Violence and Terrorism in Israel, March 21, 2018). Left: The terrorist, Rajaa’i Hadad, embraced by Mahmoud Abbas during a reception held for him at Mahmoud Abbas’ office in Ramallah (Wafa, March 14, 2018). The reception held in Mahmoud Abbas’ office was attended by senior PA, Fatah and PLO figures. Among them were Tayib Abd al-Rahim, secretary general of the office of Mahmoud Abbas; Saleh Rafat, a member of the PLO’s Executive Committee; Intisar Abu ‘Amara, Mahmoud Abbas’ office manager; Adnan Ghait, a member of Fatah’s Revolutionary Council; Mu’tassem Teem, director of the Jerusalem department in Mahmoud Abbas’ office; and Nasser Qaws , director of the Jerusalem Prisoners Club. Mahmoud Abbas congratulated Rajaa’i Hadad on his release from jail, reiterating that the issue of the Palestinian prisoners in Israeli jails is at the top of the Palestinian leadership’s priorities (Wafa, March 14, 2018). The reception was widely covered by the Palestinian media and Mahmoud Abbas documented it on his Facebook page. After the meeting with Mahmoud Abbas in Ramallah, Fatah held a reception for the freed terrorist in al-Ram (north of Jerusalem). It was well-attended and widely covered by the Fatah and PA media. Present was Jamal Muheisen, a member of Fatah’s Central Committee and responsible for Fatah’s Bureau of Mobilization and Organization in Judea and Samaria (Facebook page of Palestinian TV, March 17, 2018). Interviewed by Palestinian TV, which extensively covered the event, Muheisen said he was happy to participate in the reception for a “knight of Fatah” who spent twenty years in an Israeli jail for defending his people and their freedom. (Facebook page of Palestinian TV, March 17, 2018). Right: Fatah sign reading, “The Fatah Movement, Jerusalem district, Old City region, extends a warm welcome to freed prisoner Rajaa’i Abd al-Karim Yusuf Hadad on his release from the occupation prison” (Facebook page of Palestinian TV, March 17, 2018). 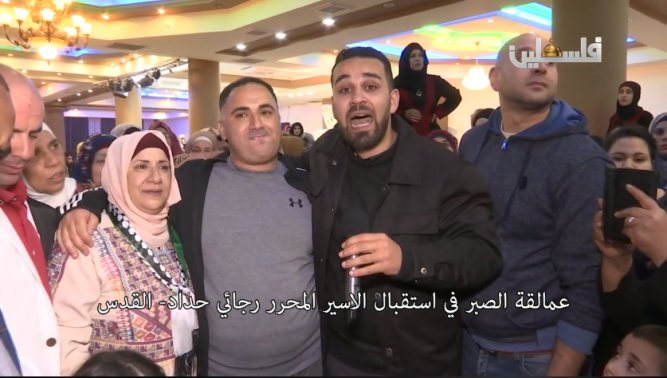 Left: Jamal Muheisen, a member of Fatah’s Central Committee and in charge of Fatah’s Bureau of Mobilization and Organization in Judea and Samaria, at the reception in al-Ram (Facebook page of Palestinian TV, March 17, 2018).